Construction has been part of the Immel family since the 1800s. Past generations made their living in the construction industry. The tradition continued in the mid-1950s, when Howard Immel and his brother, Ed, joined their father and uncle working at Immel Construction Company in Fond du Lac, Wisconsin. 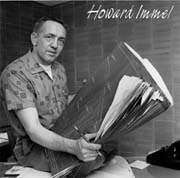 Howard eventually set out on his own and founded Howard Immel Inc. in 1961. Howard and his wife, Gail, ran Howard Immel Inc. from their home before moving to rental quarters. In 1978, Greg and Gary Immel, along with Elton Harpt, Bob Huettl, and Bud Schroeder, acquired Howard Immel Inc. and, in the time-honored Immel tradition, continued offering their clients quality and value. In 1982, the firm moved to its current location on Radisson Street in Green Bay. Over the past 55 years, Howard Immel Inc. has played a significant role in the development of some of Green Bay's most recognizable and important landmarks, including the Brown County Courthouse exterior restoration, Austin Straubel Airport, and the creation of Heritage Hill State Park. Today, Howard Immel Inc. is recognized as one of the most trusted and respected contractors in the Midwest. In 2002, the Association of General Contractors of Wisconsin named Howard Immel Inc. the General Contractor of the Year. In 2006, Greg and Gary Immel passed ownership of the company to Kelly Hafeman and Pete Smits, both long-time Immel employees. Hafeman and Smits have set their goals to live up to and exceed the high standards that were set by Howard Immel. The company will continue to serve its established customer base, including health care, retail, industrial, and commercial projects throughout the Midwest. Immel has a longstanding partnership with a select core of subcontractors that have similar philosophies and work ethics. As the company strikes out in the next century and its sixth decade in business, Hafeman and Smits promise to continue what others before them have started. With a strong customer base and a solid reputation for quality, Howard Immel Inc. will continue building a brilliant future.